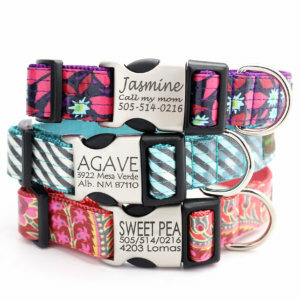 Two Options for Engraving your Custom Dog Collar! 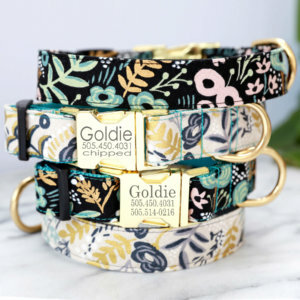 At Mimi Green, each and every collar is handmade for your dog. 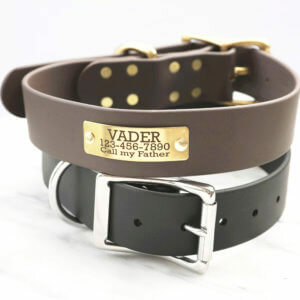 All your dog’s info will be right on the collar. Genius. 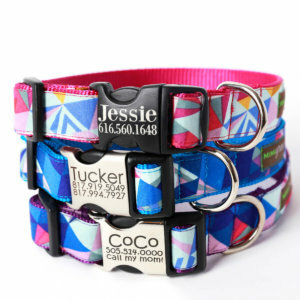 Our laser engraved buckle dog collars are highly functional and super stylish! 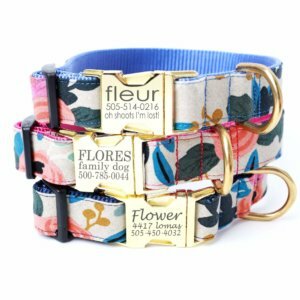 Whichever buckle you choose will be engraved with a high powered, specialized fiber laser. 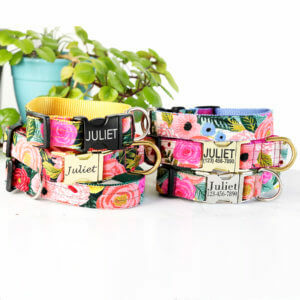 This ensures that the engraving will be long lasting and look fabulous! 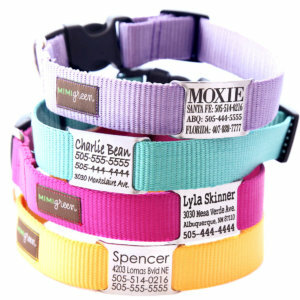 Our laser engraved name plate eliminates the need for tags and the jingle jangle that comes along with them. 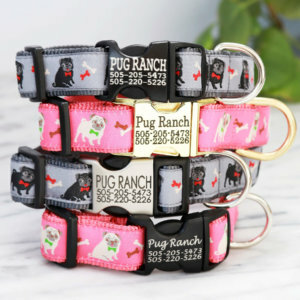 Plus, this personalized dog collar can include your number, address, microchip number or a combo of the three! Engraving is guaranteed to never wear off! 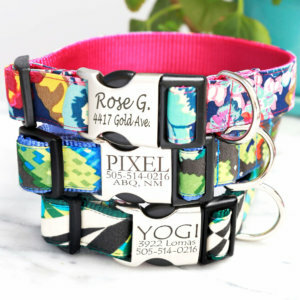 Feel free to browse any the products below that come with personalization or select any collar from our catalog and personalize it the way you want! 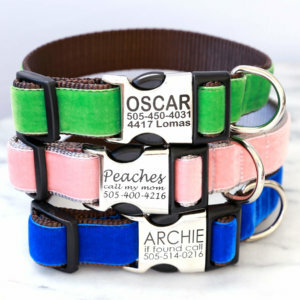 Before adding your collar, harness, or leash to your cart, you will be asked if you would like to add personalization. 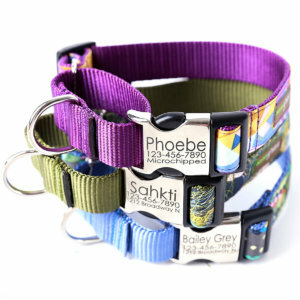 Easily add laser engraving or embroidery to most products. 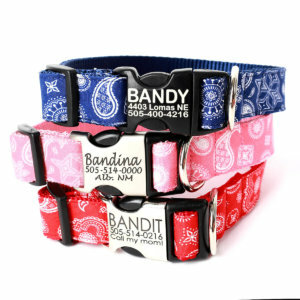 Our Engraved Dog Collars are highly functional and super stylish! 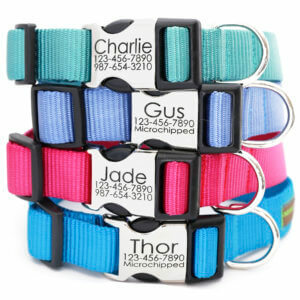 All of our different styles are available to be engraved on either a plastic or metal/plastic hybrid buckle. Whichever buckle you choose will be engraved with a high powered, specialized fiber laser. 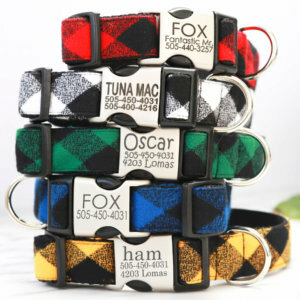 This ensures that the personalized collars engraving will be long lasting and look fabulous! 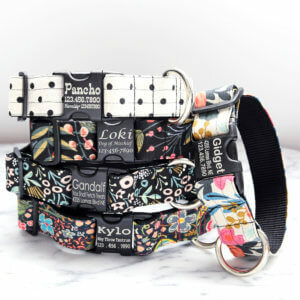 The best part of these custom handmade personalized dog collars? No more jingling tags! 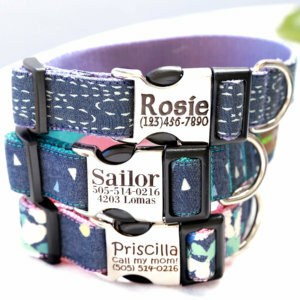 Your dog’s Name + Info on the buckle of its collar. Genius.